You can purchase certain emergency preparation supplies tax free during the 2019 Emergency Preparation Supplies Sales Tax Holiday. There is no limit on the number of qualifying items you can purchase, and you do not need to issue an exemption certificate to claim the exemption. This year's holiday begins at 12:01 a.m. on Saturday, April 27, and ends at midnight on Monday, April 29. Delivery, shipping, handling and transportation charges are part of the sales price. If the emergency preparation supply being purchased is taxable, the delivery charge is also taxable. 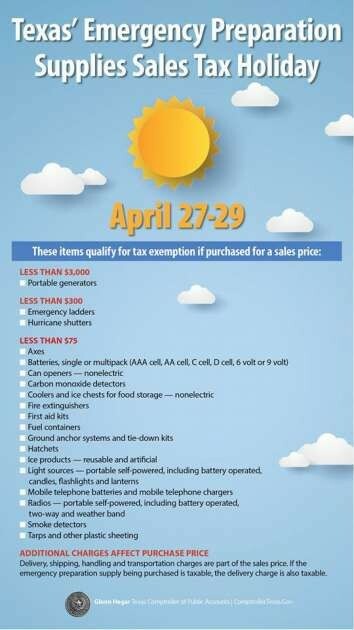 Consider these charges when determining whether an emergency preparation supply can be purchased tax free during the holiday. For example, you purchase a rescue ladder for $299 with a $10 delivery charge, for a total sales price of $309. Because the total sales price of the ladder is more than $300, tax is due on the $309 sales price. For more information, contact us at Tax Help, or call 1-800-252-5555. Help With Hurricane Harvey Needs Still Available. 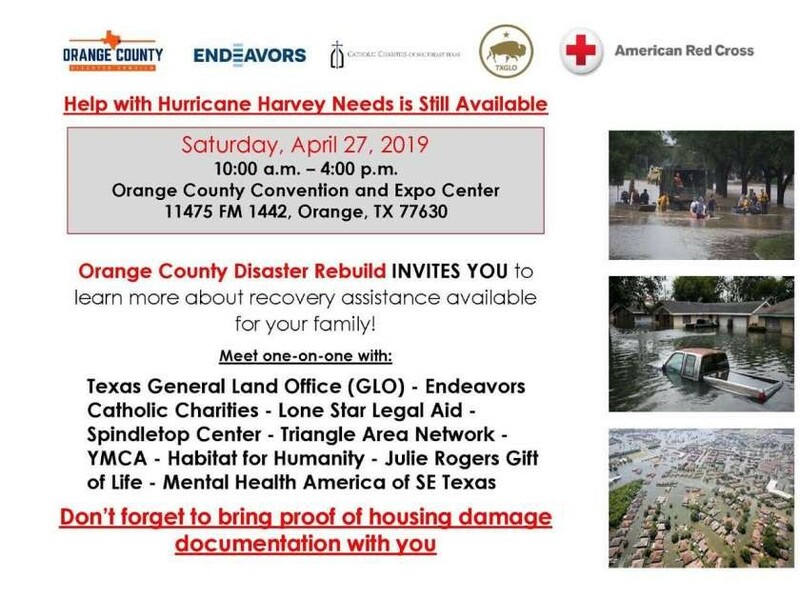 Orange County Disaster Rebuild invites YOU to learn more about recovery assistance available for your family! Don't forget to bring proof of housing damage documentation with you! 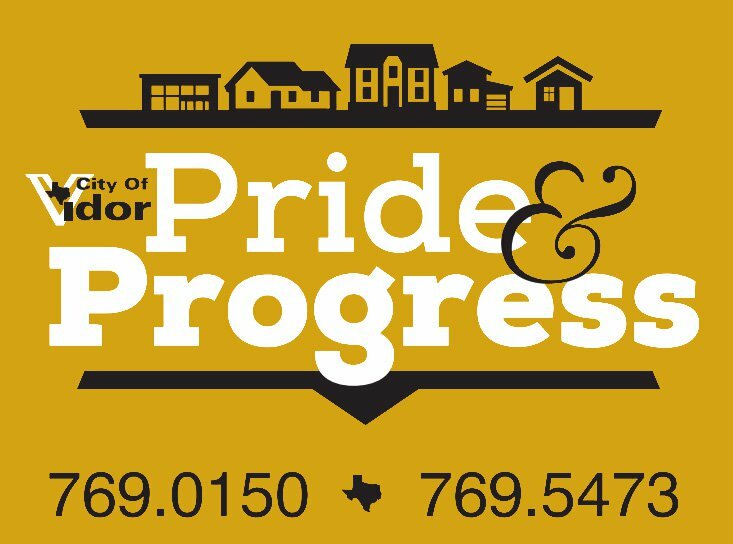 Texas General Land Office (GLO) - Endeavors Catholic Charities - Lone Star Legal Aid - Spindletop Center - Triangle Area Network - YMCA - Habitat For Humanity - Julie Rogers Gift Of Life - Mental Health America of SE Texas. 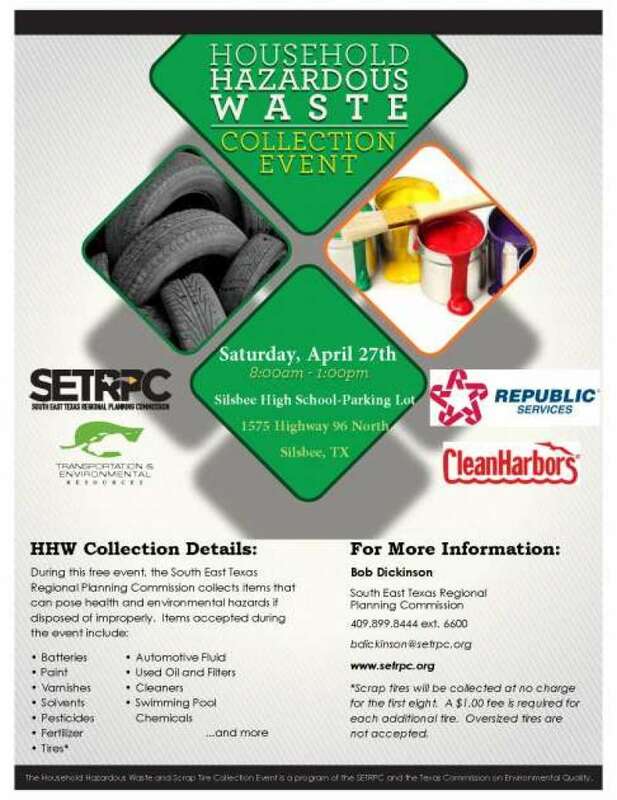 The South East Texas Regional Planning Commission is hosting a Household Hazardous Waste and Scrap Tire Collection Event, Saturday, April 27, 2019 from 8 a.m. to 1 p.m. at the Silsbee High School parking lot located at 1575 Highway 96 North in Silsbee. During this free event, the SETRPC is collecting items that could cause damage to your health or the environment if they are disposed of improperly. Some of the items include paints, cleaners, antifreeze, car batteries, used oil, insecticides, swimming pool chemicals, and many others. 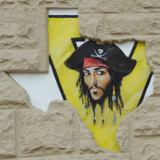 For a complete list of acceptable materials, contact Bob Dickinson at (409) 899-8444 ext. 7520. 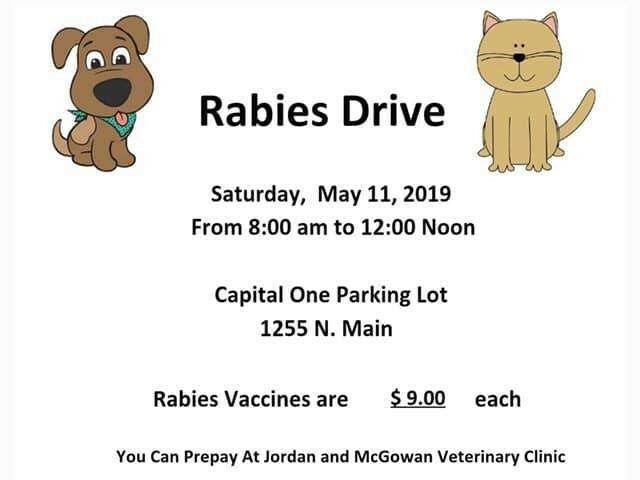 You may prepay at Jordan or McGowan Veterinary Clinics. Anyone that is a senior citizen or disabled may vote by mail. To do this you must call the Orange County Election Administration Office at (409) 882-7973 to request a ballot. This must be done by April 22 which is Monday. The Election Administration Office will send you a ballot then you simply mail back in. You must call for a ballot even if you have received them in the past without asking for one.